Okay before I begin, I have a funny story to tell about this. I saw this recipe online and was amazed at this mochi. I had never seen a mochi recipe that separated into a layer of mochi, a layer of custard and then a glorious layer of crust (yes, I count a good crust as a layer!). Needless to say, I had to make it right away and I am so happy I did. It’s a pretty crazy recipe, it asks for 4 cups of milk and 4 eggs…but we are making custard! How did it turn out? Heavenly. Absolutely perfect. I followed the recipe exactly but I have some tips of my own after the recipe I’m going to post. Funny story. So I got into work and wrote an e-mail out to the staff about how I never saw this kind of mochi before and told them all to give it a try. Then one of my coworkers tells me she has made this same exact recipe and brought it to the office at least three times. OOPS. I felt really bad but I kept laughing too! Not at her but at me writing that e-mail to the staff like I found something new or something! Luckily she wasn’t too mad since we are pretty close…lol. Here are the pictures! Wish I had a nice one sliced up to take a picture of…I was too busy trying to eat it! It is crispy, creamy, chewy all at once. All that texture makes for the perfect dessert. Preheat oven to 350 degrees. Grease 13 X 9 pan. In large bowl, cream butter and sugar. Add eggs one at a time, beating after each addition. Add remaining ingredients and mix until well blended. Pour into pan and bake for 1 hour and 20 minutes, or until center is firm. Cool and chill in refrigerator. Cut into squares — my mom suggests using a plastic knife for easier cutting. Do as Mom says, she knows best. 1) You must use a glass pan, no exceptions! 2) Do not chill it in the refrigerator! 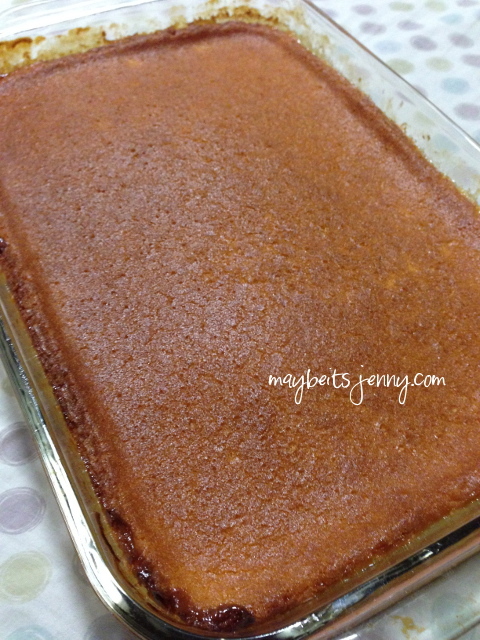 For me, I baked it at night and let it cool overnight at room temperature. Then I served it out to my office in the morning and bugga was gone before I could even throw it in the fridge. Well I did save a few pieces for my family which I did throw in the fridge (since there’s custard) and it did not taste good. The crust got really mealy and ruined the whole mochi for me, but these are just my personal tips. 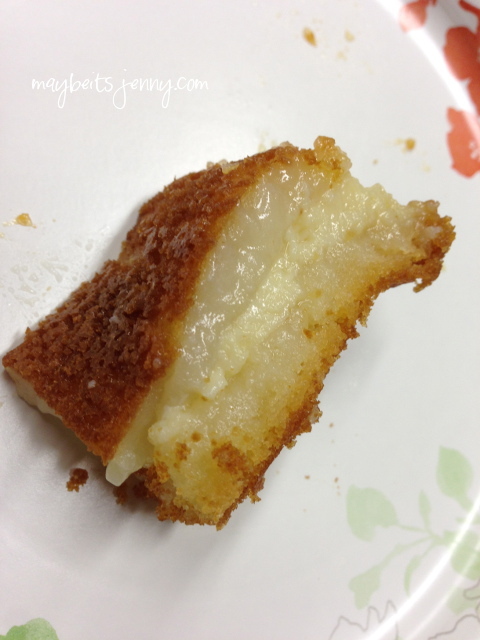 This entry was posted in Food, Recipe and tagged Custard, Custard Mochi, Mochi. hi jenny, we made this custard mochi recipe the other night. sooo ono! thanks for sharing it! hi jon! that’s great to hear~! so glad it was good, thanks so much for commenting! Hi Denise! Thanks for commenting! Too funny you mention, of course after I make it…everyone tells me they made it before. Sorry, I think this recipe made the best batch so thanks for sharing it! I haven’t tried the chocolate version either but that sounds like it would be a real hit! Can I use a fork just to mix it or would it be better to use an actual mixer? 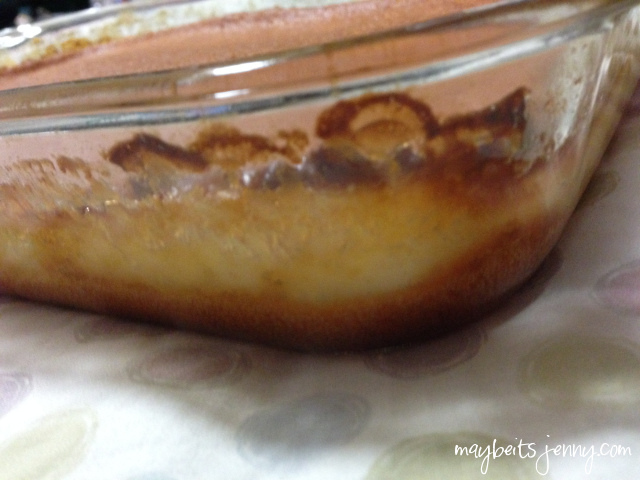 Hi I have a question… does the custard part just magically appear when you bake it? This looks delish! i made this recipe last week and it’s delicious! Best ever! Tonight I’m experimenting and using coconut milk and cocoa powder. Crossing my fingers that it turns out with the 3 layers. Oh my, Tonja! I really hope this new experiment comes out! I am waiting to hear back from you! So glad you enjoyed the original! Just realized I never commented back with my results! I’m making the original recipe tonight and came across my comment from last year. It was still delicious tho!! Sounds delicious! If I made this for the holidays and packaged for Chrismas goodies, would I need to refrigerate it or tell people they need to refrigerate it or smear it right away? OK…I really want to make this …it looks soooo Yummy! Where do I get the mochiko ( sweet rice flour)??? I hope it’s not hard to find . Hi Joan! So glad you want to make this recipe! I love almost all mochi recipes! If you can find some in your grocery store in the Asian foods section, that would be great. If not, Amazon is a great option! Here’s a link to the brand I use, it’s a bit more than I pay here in Hawaii but it’s not too bad! Happy baking! Please let me know how it comes out! I live on the Big Island and they sell butter mochi everywhere; they even sell ono butter mochi at the gas station! But I have to give the prize to yours. It is the best butter mochi ever! Mahalo for sharing. I don’t know what I did wrong but the mochi came out to be a single layer and no custard part appear. Do you have any suggestion? Hi Jenny, after adding the eggs, do you need to whip the eggs until fluffy and double in volume like how one would do with cake recipe? or just whisk until the eggs are just mixed with the butter? I wonder if the middle layer of ‘custard’ isn’t just an uncooked layer..? This also happens to my cassave cake! If it isn’t done yet there’s a soft, light-colored layer in the middle…then it needs to bake a little longer. I’m going to try this butter mochi, never had it, but I LOVE ‘ketan’ flour.. I have never thought of that…and I’m thinking you’re right? Maybe I haven’t baked it long enough? That’s very plausible. I really hope you’re going to try this recipe and please let me know how it turns out for you! Hi! BTW!! Hands down the best butter custard mochi everrrr!! Just curious to know if you’ve tried to bake this in a cupcake pan? I personally love all the crunchy edges that come with baked mochi. So I wanted to try it in a cupcake pan but I’m not sure on baking time. Thank you!! Finally a mochi recipe that doesn’t call for coconut milk (allergy)!!!! Going to give this recipe a try – thank you!!! That’s great! I hope you like the recipe! Let me know how it turns out! How did it tuen out baking it in a muffin pan? I’m curious how it turned out because one of your tips is to use a glass pan (no exceptions) but I haven’t seen a glass muffin pan before. What would happen if I baked this in a metal loaf pan?